Last month I visited the National Alpaca Show in Telford and was delighted that Shropshire had a high profile. The county is well and truly on the map- thanks to Newport’s Alpaca Farm Eggnog, named as the Supreme Huacaya champion. Alpaca Farm Eggnog is the first female winner of Supreme Champion in over ten years. The accolade was a great victory for a small local breeder against competitors from all over the country. 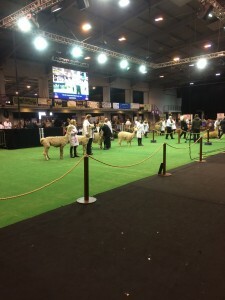 In total 450 alpacas were exhibited at the event. We’ve been in a spin at the Coco Alpacas shop in the past few weeks- but in the nicest possible way! We welcomed Fiona Nisbet to the shop to give us a spinning demonstration on February 18th and quite a few people came in to watch. Fiona brought her own Joy 2 double treadle spinning wheel, which folds up and is easy to carry around: she spun some alpaca fleece that she had carded and hand dyed. There’s been a real buzz around the Coco Alpacas shop since its launch in November- and the great atmosphere looks set to stay throughout February and the rest of 2016 as we continue with our workshops and special events. I have lots of news to share with you about my plans for 2016 – but first let me wish you a Happy New Year. I hope it’s a happy, healthy and prosperous year for all of us! My feet haven’t touched the ground since my last blog post. I’ve been so busy arranging the stock in my new Coco Alpacas shop, dressing the shop window, meeting members of the public and the press, and of course looking after my beautiful animals! The opening day was very successful and I had alot of support from Church Stretton folk and further afield too, because many people had read an article in the Shropshire Star about my new enterprise. Everything just fell into place on the day and the feedback has been overwhelmingly positive: people seem to agree that it’s good for the town to have something a bit different, and my little cottage industry seems to have been welcomed with open arms. Shop Opening Saturday 14th November 2015! The past few weeks have been gathering pace as I prepare for the grand opening of the Coco Alpacas shop – I’m just a couple of weeks away from this very exciting new enterprise. Shop Opening in Church Stretton! I have some exciting news to announce this month. 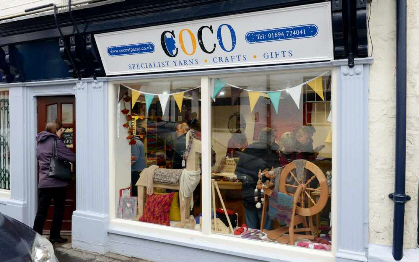 Church Stretton is getting its very own Coco Alpacas shop in the High Street – and it will be packed with stylish alpaca knitwear and specialists yarns. 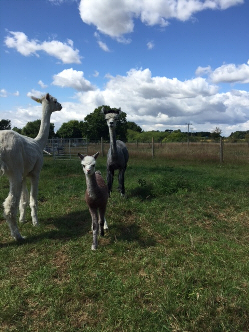 What a lovely surprise I had on July 14th, when a beautiful grey cria (baby alpaca) arrived safe and sound, and snuggled up to her proud mum, Keira. I knew a baby was on the way, but I had no idea at all of the date. Keira was running with a stud male near Kidderminster in Worcestershire last year, and was pregnant when I bought her in October. Our new arrival is quite a rarity; she is a stunning shade of grey, and her fleece is looking good at just a few weeks of age. She is a very welcome addition to the herd. I’ve been so lucky with all my alpaca births so far: my females have given birth naturally without any complications, and the crias have all been good feeders. Alpacas are pregnant for eleven and half months so I imagine its quite a relief for them to give birth! Keira will feed her cria for six months and then she will be weaned. June was a busy month for me and my two alpacas, Felix and Wizard, who accompanied me to the Three Counties Show at Malvern at the weekend of June 13-14.